Description: Ketones and other carbonyl compounds containing a hydrogen adjacent to the carbonyl are in equilibrium with a constitutional isomer called an enol. Notes: Generally speaking the “keto” form is more stable due to the strong C–O π bond. The rate of interconversion between keto and enol is accelerated by acid. Other factors such as greater alkene substitution, etc. assist as well but these are the major factors. Mechanism: Protonation of the ketone oxygen by an acid (Step 1, arrows A and B) leads to formation of an oxonium ion, which is then deprotonated at carbon to give the enol (Step 2, arrows C, D, and E). H–A here could be water (H2O) or an acid of some kind that is added such as H2SO4 or HCl. The rate of tautomerism is greatly increased by the addition of strong acid, since formation of the oxonium ino makes the adjacent C–H bond considerably more acidic (and easier to remove). If you make a model you will see why this is impossible. If you compare the positions of Ha and Hb in the starting material and the product you should see why this does not work. Hi! 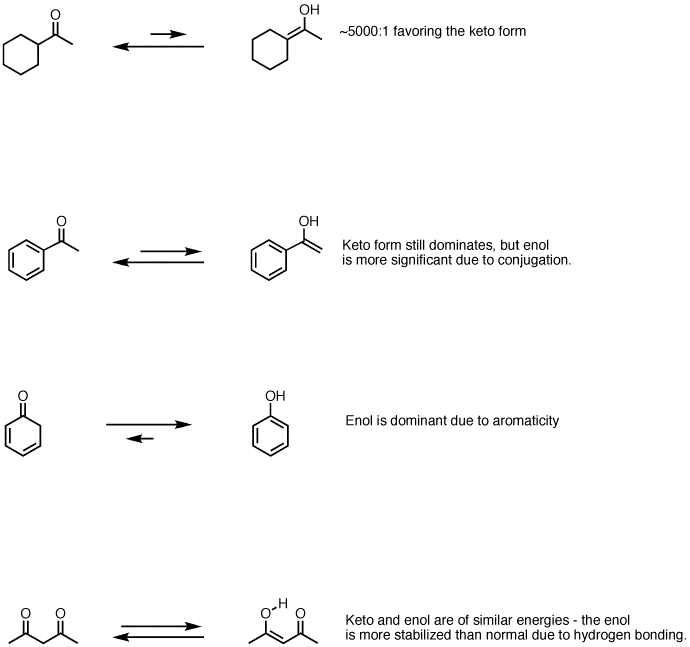 i read through your notes for keto-enol-tautomerism. I just have a questions, why is 2,4-pentandione is more favourable as an enol? is it because of the conjugation? could you please explain to me why? Thank you. Two reasons! 1) if one ketone is present as an enol, then it can participate in a hydrogen bond with the other ketone carbonyl, which is a favorable interaction. And yes 2) it is also conjugated, so that has an impact as well. The Video Walkthrough is down. Thanks, I need to fix this. why when the oxonium ion come form enol the deprotonation for oxygenatom…?? in both cases is the same intermediate? ?